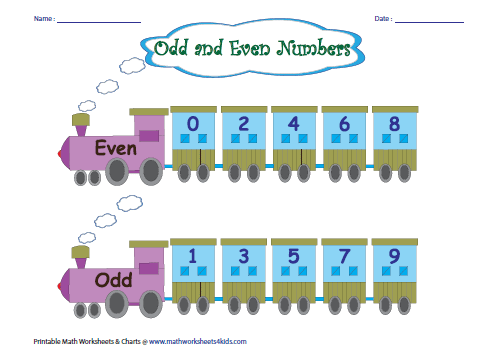 Odd and Even charts have attractive images with odd / even numbers, cut-paste activities and printable hundred charts to give in-depth understanding of odd and even numbers. Odd-even charts are done in a landscape layout to make them more appealing to children. Two steam engine trains carry even numbers and odd numbers on their passenger cars. 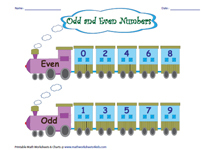 Children stand hand in hand with even and odd numbers displayed on them. T-shirts are hung on the clotheslines with even and odd numbers printed on them. Odd-even charts are available here in a portrait view. Colorful pictures are displayed in each chart. 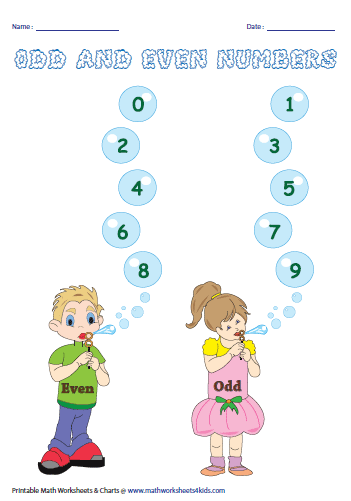 Even and odd numbers are displayed on soap bubbles. Cartoons carry placards with even and odd numbers on them. Ice-cream cones have odd or even numbers on each scoop. Printable hundred charts are given here. Odd and even series are highlighted. Odd numbers are shaded green to highlight the odd series. Even numbers are shaded blue for better recognition of the even series. 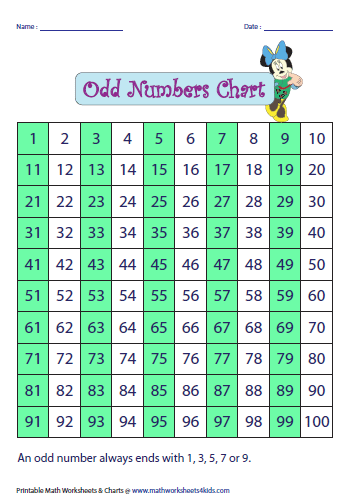 Numbers up to 100 are shown and odd / even series are shaded in different colors. An engaging cut and paste activity is given here for children. Help the kittens, puppies and chicks to identify their moms. 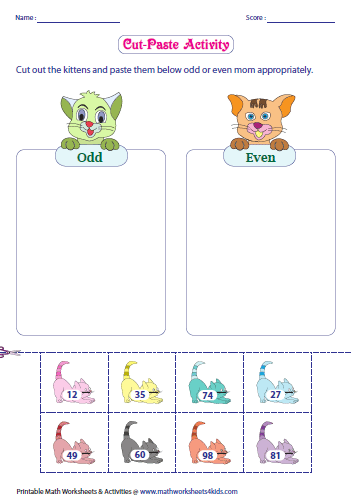 Cut out all the odd kittens and paste them below their odd mom and even kittens below their even mom. Cautiously cut out all the puppies and paste it below their odd and even moms. Carefully cut out all the chicks and paste them under their mom in the given tabular column. A board with an odd and an even street is shown in the first sheet. Cut out any ten consecutive odd / even labels (houses) from sheet 2 and glue them under each street. A sample activity is given in the 3rd sheet.